WordPress, which has made life easier for bloggers as well as website developers in introducing a personal publishing platform or tagged as a web software to create, update and maintain a website or blog, built by hundreds of WordPress community volunteers, has just introduced a brand new theme called the Toolbox. Toolbox loads in great new features giving users take advantage of HTML5 elements with Custom CSS upgrade. 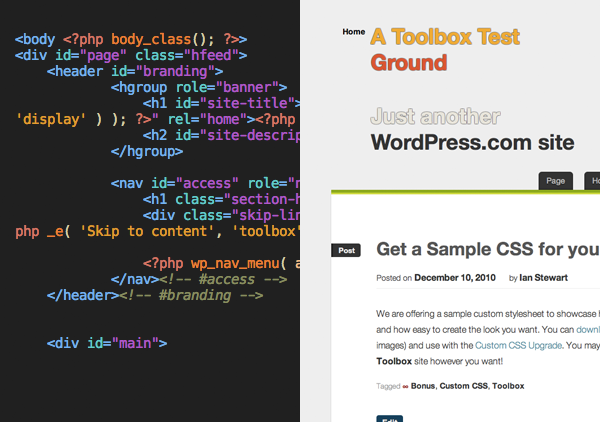 According the WordPress blog, the theme is much alike the Sandbox Theme which provides all the access to build your very own them with CSS alone. One thing which makes this theme, the “Toolbox”, different from others specially the Sandbox Theme is that it uses the HTML5 elements. Designers now have the ability to do “anything you want”. Toolbox theme can also be used to build-up a self designed theme for your blog. It’s an interesting information. Where I get little detailed information about it? any adsense option is there? ?